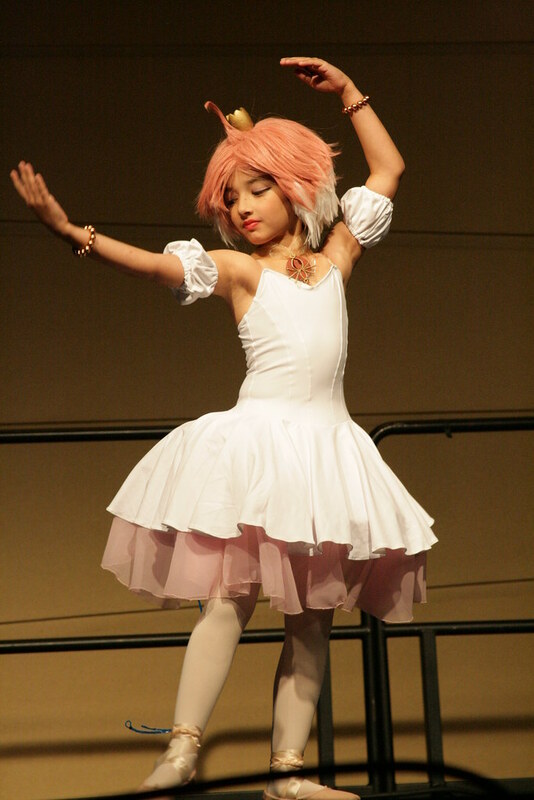 The only child to participate in the Cosplay Masquerade at ConnectiCon, Aurora took the stage by herself and performed a ballet piece cosplaying as Princess Tutu from the anime. A beautifully well done performance, and a very beautiful cosplay, it was an inspiring sight to see such a young child show a crowd full of people her love for cosplay. While Aurora was the youngest participant in the the masquerade, this was not her first time cosplaying. She comes from a family of cosplayers. Starting with her mother Karen, who took her to ConnectiCon this year, and her older sister as well. Her mother Karen became inspired to cosplay through the music of J-Rock, her eldest daughter got into classic animes such as Sailor Moon and Card Captor Sakura, which eventually led them to discover more anime. While she is only 8, Aurora was exposed to anime pretty young in her life. Animes such as Card Captor Sakura, XXXholic, Frozen Maiden, and of course Princess Tutu. As far as conventions, Aurora's mother Karen has been attending them since 2001, and has been taking Aurora since she was 6 months old. Karen has cosplayed at Otakon, AnimeBoston, AXNY, Katsucon, AnimeNext, AnimeNorth, AWA, ACEN, Shoujocon & Lunacon, but in the past 5yrs has cut back and now mainly attends: ConnectiCon, Arisia and occasionally AnimeBoston. While Aurora has attended and cosplayed at ConnectiCon and Anime Boston 3 times. The Arisia Sci-Fi convention has been the staple of their convention going since Aurora was 6 months old. Were you yourself into cosplay, anime, or comic books? I actually got into cosplay way of jrock. My older daughter (Aurora's sister) used to watch Sailor Moon and Cardcaptor Sakura which eventually led to us discovering and watching more anime. Aurora was exposed to it at a young age and likes watching Cardcaptor Sakura, Rozen Maiden, xxxholic and Princess Tutu. Was this you or your daughters first convention? If not how many and which ones? I have been going to conventions since 2001. I have cosplayed at Otakon, AnimeBoston, AXNY, Katsucon, AnimeNext, AnimeNorth, AWA, ACEN, Shoujocon & Lunacon. We've cut back on conventions in last five years or so and mainly just go to ConnectiCon, Arisia and occasionally AnimeBoston. Aurora has attended and cosplayed at ConnectiCon three times, AnimeBoston three times and Arisia (Sci-Fi convention) nine times (I took her when she was only 6 months old and every year since, she is 8 now). She has participated in ConnectiCon's masquerade three times, but the previous two years she just entered as craftsmanship walk-on. She has participated in Arisia's masquerade four times. What inspired your daughter to cosplay, as well as enter the masquerade? I just asked her and she said that she saw other people dressed up and wanted to do it also. She has been taking dance classes for five years, she had just had a dance recital a month before ConnectiCon and we adapted her ballet dance to the Princess Tutu music. How nervous were you for her when she got on stage? She is pretty calm about going up on stage and doesn't get nervous. As a parent I am always a little nervous for her. Are there any other cosplays in the works for her? She would like to do Quorra from Tron, she loves the movies (both the original and new) and I like playing around with el lights, so it might happen. What will be your next convention? Definitely Connecticon and Arisia, maybe AnimeBoston.